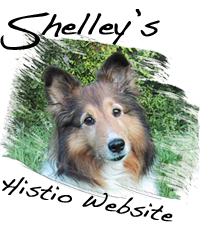 On September 5th 2001 our 11 year old female Sheltie 'Shelley' died of Malignant Histiocytosis (MH). Nowadays Malignant Histiocytosis is also known as Disseminated Histiocytic Sarcoma. We were told that MH is a rare, invariably fatal disorder in which histiocytes multiply rapidly and invade a wide variety of tissues. Histiocytes are a type of white blood cell which forms part of the dog's immune system. Histiocytes are derived from cells in the bone marrow and migrate to their various tissue sites via the blood stream. They usually clutch and dispose of material that should not be present in the body. For some reason, dogs with MH have too many histiocytes. These cells accumulate in certain areas and cause problems. Malignant Histiocytosis or Disseminated Histiocytic Sarcoma is very uncommon in most breeds, but the Bernese Mountain Dog, Golden Retrievers, Flat-Coated Retriever and Rottweilers are striking exceptions and therefore that type of Histiocytosis is believed to be inherited. If it occurs in other breeds (like in our case a Sheltie) it is just plain bad luck. In all cases the cause is still unknown, so prevention is at present not possible. It may be triggered by an unusual reaction of the immune system to something commonly found in the environment or maybe even from a vaccination against rabies or distemper. It is not infectious. There are different types of Histiocytic diseases; some are benign and some are malignant. I find it confusing that scientists have been changing and adding names and types, but it shows that scientific research is being done as I write this, which is of course a good thing. I'll try to keep it as simple as possible. Canine cutaneous histiocytoma is a benign skin tumor in young dogs which usually disappears spontaneously. Multiple histiocytoma's are sometimes confused with CH. Click here for photo's of Farley's histiocytoma's. Cutaneous histiocytosis (CH) is a skin tumor with multiple lesions, which will wax and wane and sometimes disappear completely. This tumor usually needs long term immune suppression therapy. When spread beyond the skin occurs, the diagnosis changes into SH. It is difficult to distinguish the difference between CH and SH, cause the microscopic features of the skin lesions are identical. So some dogs that are diagnosed with CH can actually have SH and vice versa. Systemic histiocytosis (SH) is like CH, but spread beyond the skin occurred and organs or bone marrow may be involved. In the beginning the lesions will wax and wane like in CH, but SH is a highly progressive disease which needs ongoing immune suppression therapy. Unfortunately severe active cases of SH will not respond well to immune suppression therapy and consequently some affected dogs will end up being euthanized. Histiocytic sarcoma (HS) is a histiocytic tumor in one single site. If discovered early, surgical removal of the tumor will give the best prognosis. So in this case amputation of a limb or removal of the tumor might save your pets life. However, when the tumor has spread beyond the local lymph nodes, the diagnosis of Histiocytic Sarcoma changes to Disseminated Histiocytic Sarcoma (DHS), which is similar to Malignant Histiocytosis. The spread usually goes unnoticed with lesions in the spleen, lungs or bone marrow. So before surgery/amputation I would recommend a thorough checkup with x-ray's and ultrasound to rule out DHS/MH. Disseminated Histiocytic Sarcoma or Malignant histiocytosis (MH). MH is the most aggressive Histiocytic disease with tumors in multiple sites simultaneously. As some of the tumors of HS and MH arise inside the body it is difficult to distinguish the difference between the two forms of Histiocytic diseases, so some dogs that are diagnosed with HS can actually have MH and vice versa. HS or MH usually occurs in middle-aged or older dogs and is always a death sentence. Survival from time of diagnosis may vary from hours, days, weeks, and rarely months. In HS and MH histiocytes infiltrate organ systems especially the lungs, liver, spleen, bone marrow, and lymph nodes. The clinical signs vary depending on where metastasis of abnormal cells occur, but it is usually already widespread before any symptoms are noticed. Early symptoms include recurrent fevers, depression, lethargy, loss of appetite (anorexia), weight loss and in some cases the eyes may become prominent. Blood chemistry may be normal; or it may show anemia, a decrease in the number of platelets, or high liver enzyme activity. Malignant Histiocytosis commonly metastasizes to the lungs, resulting in multiple tumors causing respiratory signs such as coughing, increased breathing rate and shortness of breath. X-rays may indicate internal masses and other abnormalities. HS or Malignant Histiocytosis is quite rare and in spite of countless efforts by scientists and physicians all over the world there is no approved treatment or medicine at this time. It spreads rapidly and as metastasis is generally present at the time of diagnosis surgical removal of affected tissue is not effective. Chemotherapy and radiation therapy have been tested, but resulted in short term success only and therefore they are not a cure. As prognosis is poor, the only thing owners can do is to observe their dogs quality of life closely to determine the appropriate time for euthanasia. Your veterinarian will work with you to keep your dog as comfortable as possible, until the quality of life deteriorates to the point where euthanasia is the best option. This is a very emotional and stressful time for the owner, but our dog did very well on the proper painkillers until a few hours prior to her death. To determine the extent of the disease and subsequent treatment plan, several tests can be done. These include blood tests, x-rays of the chest, bones, CT scans and a biopsy of the tissue involved. Biopsy can be done with a fine needle aspiration (FNA). Such FNA procedures are typically done by a radiologist under guidance by ultrasound and require no anesthesia, not even local anesthesia. A needle no wider than that used to give routine injections is inserted into a lump (tumor), and a few tens to thousands of cells are drawn up (aspirated) into a syringe. These are smeared on a slide, stained, and examined under a microscope by the pathologist. A diagnosis can often be rendered in a few minutes. In view of the above it is recommended that you consider having your veterinarian remove and biopsy any suspicious growth to determine its exact nature. I am looking for similarities in all individual cases of Histiocytic diseases. I wonder if we all tell our stories and complete the histio questionnaire, we might come up with some commonality between the specific situations in which all of our pets got this disease. But I can only do this with your help! Please write your pet's histio story and/or complete the Histio questionnaire and send it to me.